La Bombonera is the bomb-diggity of gelaterias! Oh Sweet Mother of gelato... 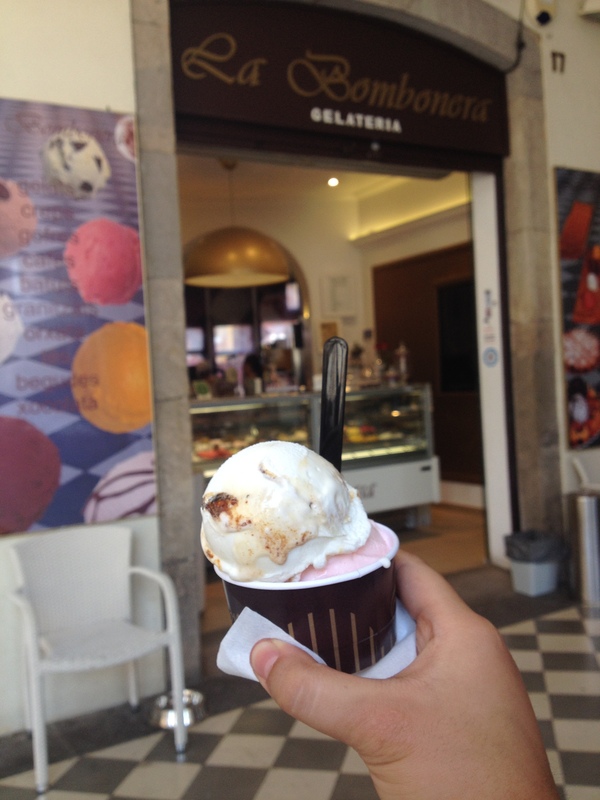 When in the beautiful city of Girona, please visit La Bombonera Gelateria! I went inside with pretty high expectations, but once I was acquainted with the sight of the unique variations of gelato flavours, I was mind blown! My expectations were out the window! What I witnessed went beyond! From your famous favourites like chocolate, strawberry, cookies and cream, to the unique flavours of tamarind, mojito, and even rose petal, which was the one I tried, alongside ricotta cheese and fig flavour! The rose petal flavoured gelato is clearly not for everyone, but it definitely pleased my tastebuds! The zing of the fragrant pink flower was unexpected, yet blended into the sweetness and creamy texture of the gelato. I admit you can't have too much scoops of this flavour since it starts to remind you of perfume as you keep eating, but the first few tries are beautiful. Though this rose petal flavour really got my curiosity, my favourite flavour had to be ricotta cheese! Having tried queso flavour in the Philippines already, I could tell this gelato was going to be delicious... but it was so much more. The subtle saltiness of the creamy ricotta against the rich sweetness of the milky gelato and figs fused together in a flurry of wonderful sensations... oh, boy, do I miss it! I have to say, it was unforgettable. It was worth the walk around Girona since it is a splendid city with so many sights to see anyway - a nice place to wander around with a loved one and endure the city's history, art and culture. You can't avoid eating gelato there since there's at least three gelaterias in each alley, but avoid all of them until you see La Bombonera - it's the cheapest I saw there too, where you can get two big scoops for 2,50 euros! Trust me, you won't regret it!